Goat milk makes an incredible soap that is perfect for sensitive or dry skin. It even provides powerful anti-aging properties to keep your skin young and healthy. If you have milking goats, making your own goat milk soap at home is a simple process, and one you’ll be glad you undertook. In addition to giving you a greater level of self-sufficiency by taking one more item off your grocery list, making your own goat milk soap creates another source of income for your farm. Goat milk soap has a high content of alpha-hydroxy acids like lactic acid which break down dead skin cell bonds. Dead skin cells are removed, leaving behind smooth, youthful skin. The fatty cream in goat milk soap provides a strong anti-inflammatory effect which soothes dry or damaged skin. Many super market soaps contain harsh chemicals to break down dead sin cells. Over time exposure to these chemicals can actually burn your skin, causing lasting damage. Goat milk soap is free from any harsh chemicals, using only natural acids to gently dissolves dead skin cells. Each bar is full of essential vitamins including Vitamin D, C, B1,B6,B12 and E that nourish your skin. Goat milk soap has antibacterial properties that slow the growth of microbes which spread acne. 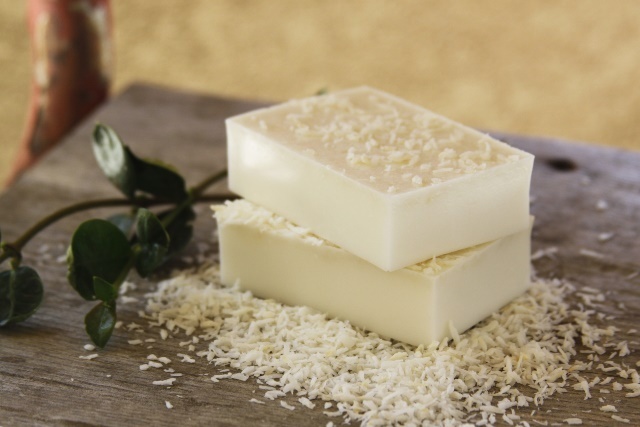 Here are two recipes that make beautiful, creamy goat milk soap. You’ll see the best results if you use goat milk from your farm or a neighbors. Goat milk should be frozen immediately, then used to make soap at any time. The first step is to dissolve the lye in the goat milk. The key to success is keeping the mixture very cold. When you combine lye with liquid it produces heat. Not only can this mixture burn your skin, it can also scorch your milk, ruining the soap. Start with frozen goats milk. Use a metal or wooden bowl immersed in a larger bowl filled with ice water. As you mix the lye an milk together, keep adding more ice to the bowl so it stays cool. When all the lye is dissolved, set the mixture aside, but keep it on ice. Mix your oils together and heat them gently to 110-125°F. Slowly pour the lye and milk mixture into the oil mixture and stir. You can start stirring by hand, but later on you’ll want to use and immersion blender to speed things up. Mix until the soap reaches “trace”. This occurs when it becomes thick and smooth, like pudding. You can buy soap molds or use homemade ones. Remove the soap from the molds after 24 hours. At this point you can slice the mold into bars if you choose. Let the soap cure for about a month. During this time the lye will continue to react, slowly hardening the soap and removing any bite or sting left from the lye. Voila! You’ve made your very own goat milk soap. Of course, you don’t have to make your own goat milk soap to enjoy the benefits on your skin. You can buy goat milk soap in a number of places. Just remember you are looking for unprocessed goat milk soap, preferably fresh from the farm. If you are not aware of a local goat dairy, ask someone at the farmer’s market. Many natural foods stores have natural goat milk soap for sale as well. Consider electric netting? Find one at www.electricnetting.com.au . Watch a master goat milk soap maker at work!